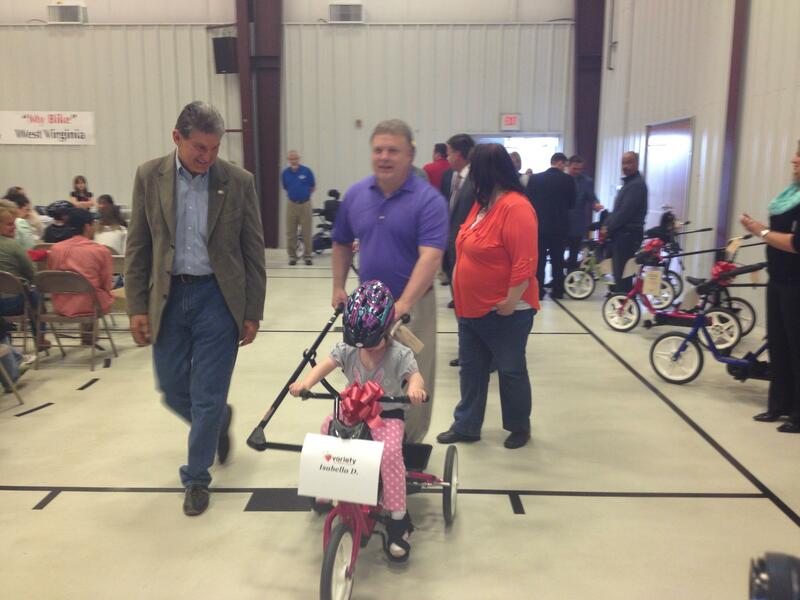 Isabella goes on the bike parade with Sen. Joe Manchin. For young children with certain disabilities, it’s just about impossible to ride a conventional bicycle. So a children’s charity known as Variety, which began in Pittsburgh in 1928, along with several people who wanted to get involved, started a program called the “My Bike” program. It provides specialized bicycles, that are built to suit the special needs of the child. Nearly 30 children received these specialized bikes at a recent ceremony in Morgantown with Variety. One of the most exciting aspects of the event was a bicycle parade, when the children rode these rides for the first time around the SteppingStones Facility in Morgantown. One of the children, six year old Isabella, was extremely excited. It was her first bike, according to her mom, Stephanie Derby. "We have tried other bicycles from general stores, and nothing has ever worked for her, and she gets kind of frustrated. When she got to try the bike out the first time, she was so excited, and she was pedaling and going within seconds. It gives her a sense of independence; it also gives her an opportunity for a shared activity with her older sister," she said. Derby says her children like to ride bikes in their spare time. She says now with Isabella in the seat she hopes the whole family bonds together over this recreational activity. "Now that [Isabella] is going to have one, it’s something that we will hopefully do as a family and get some good exercise," said Derby. These are the first bikes of this kind to be donated through Variety in West Virginia. There are three wheels on the bike, instead of two. There’s a handle bar that looks like those on exercise machines and there are special safety straps too that aren’t on other bikes. Adults can step in and help maneuver the bike if necessary. Isabella’s family proudly watched as she wheeled around in the bicycle parade. Also on hand was U.S. Sen. Joe Manchin. He walked around the room with some of the children during the parade. He says his son in law told him about this charity; he hadn’t heard of it before. He says for children to succeed, they need adults in their lives to provide guidance. "These children are blessed because they do have adults out there who care about them. They want for them to have a normal life as much as humanly possible and today it’s a dream come true for them. It’s really special," he said. According to Variety, for a family to qualify for a bike, it must reside in one of 10 counties that are participating and the family’s income must meet specific poverty guidelines. The counties participating are Barbour, Doddridge, Harrison, Marion, Marshall, Monongalia, Ohio, Preston, Taylor and Wetzel. A private foundation says the well-being of West Virginia's white children is the worst in the country, while black children in the state fare slightly above the national average. West Virginia’s got a lot of deer within its borders, and they can be a burden. For instance, the state’s vehicle collision rate with deer is one of the highest in the nation, according to a study by State Farm Insurance. In Morgantown, new technology is being used to monitor these animals. You see them while driving along the interstate. You’ll catch them in your residential neighborhoods, eating vegetables from your garden. Panelists discussing the media coverage of the recent Elk River water crisis say digital media platforms played an important role in how they covered the story. More than 300 people were in attendance Monday night at West Virginia University to hear insights panelists gleaned from reporting on the crisis. Monday evening, a special panel will be discussing the recent water spill into the Elk River. This panel will be made up of journalists who covered the event, which affected the water supply of about 300,000 state residents. This panel at West Virginia University is designed to analyze local and national coverage of this event. It will also discuss how crisis news coverage has changed, in today’s digital news media environment. Maryanne Reed is the dean of West Virginia University’s P.I. Reed School of Journalism.